The original Bid Manager's Handbook continues to provide an invaluable resource in the battle to win new business. Winning significant business on the right terms is an increasingly complex, challenging and time-consuming task, and a successful bid is a vital part of any business offering its services or products to another. This book will help you to enhance the probability of success in winning bids at the desired margins and to set up and run effectively a bid management team. The Handbook is aimed at sales staff managing multi-disciplinary bid teams, and project and technical managers who find themselves managing a bid to support a sales campaign. Taking a practical approach and using real-life examples, David Nickson leads the reader through every stage of planning for, producing and delivering a bid. Crucially it also shows how to save time - the most important commodity in any bid - without affecting quality. 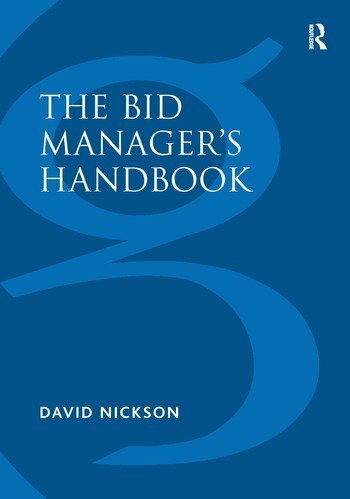 Now the original Bid Manager's Handbook has been repackaged to include additional material that expands on the writing and editorial side of the bid, the use of bid management software and the bid review process. Contents: Introduction: What is a bid? ; Why do we do them? ; Structure. Bid Management: Summary; Roles and Responsibilities: Why have roles and responsibilities? ; Role of the bid manager; Context; Responsibilities of a bid manager; Example job description; Summary; Internal vs. external bid managers; Case study; Checklist. Methods and Approaches: Bid brief; Reviews; Information technology; Formal methods and standards; Case study; Checklist. Risk Management: Risk management - a potted guide; Sample risk for bids; Example bid risk plan; Risk as a deliverable; Case study; Checklist. Administration and Logistics: Bid file; Documentation; Distribution; Confidential information; Risk register(s); Back-up policies; Meetings; Resources; Case study; Checklist. Planning: Timetable; Deliverables; Activities; Dependencies; Resources; Costing; Sample plan; Change; Case study; Checklist. Writing and Editorial: Summary. Writing Skills: The basics; Fact, feature and benefit; Writing styles; Writing a (management) summary; Annexes and appendices; Plain English; Covering letter; Proofreading; Case study; Checklist. Editorial Skills: The basics; Templates; Tracking changes; Style(s); The details; Proofreading; Presentations; Case study; Checklist. Layout and Presentation: Suggested guidelines; Bid documents; Presentation material; Style guide; Case study; Checklist. Personal Skills: Summary. Communication: Theory into practice; Basic skills; Meetings; Presentations; Written communication; Case study; Checklist. Teams: The generic bid team; The life cycle of a team; Team roles and composition; Subcontractors and partners; Communication within a team; Conflict; Group think; Case study; Checklist. Negotiation: Negotiation cycle; Negotiable items; Negotiation strategies; Exploring within a discussion; Closing a negotiation; Case study; Checklist. Sales: Sales awareness; Risk register as a sales tool; SWOT analysis; SWOT example; Sales themes and the bid brief; Client interaction; Qualifying the client/bid; Culture and environment; Case study; Costing; Pricing; Case study; Checklist; Appendix: Bid brief template; Glossary; Additional reading; Index. CONTENTS FOR REVISED EDITION SUPPLEMENT: Introduction; Part one - Bid Management. Part two - Writing and editorial. Part three - Personal Skills; appendix of new materials - Answer the question (ATQ) and Answer the question only (ATQO); Sales themes and executive summaries; Supporting technology; Model answers; Using professional authors/editors; Review processes; Bid writers reference card. Glossary; Index. David Nickson has managed and contributed to major bids to both the private and the public sector, including government departments, local authorities, multi-nationals, the media, charities and service suppliers. Within this arena he has worked as a manager, consultant, methodology developer and trainer.